Format Conversion can convert your GIF/JPG image files to AutoCAD (DWG) format. 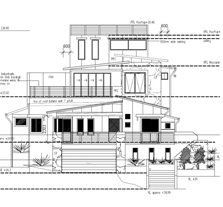 Our manual DWG conversions are fully editable, multi-level and 100% dimensionally accurate. We follow AIA Standards and can also accommodate your seed file and CAD standards The final output will be editable and in DWG format because we recreate the drawing from scratch. We can create as many layers as you require and we can generate separate layers for dimensions, text, body, hidden lines, and centerlines, etc. Text is separate, has its own level, and is recognizable as text. Dimensions are intact and shown in a separate level. GIF/JPG to DGN conversion services are also known as Raster to Vector Conversion (R2V). GIF (or Graphic Interchange Format) and JPG or JPEG (or Joint Photographic Experts Group) are file formats for storing images, including photographs and line art. GIF/JPG is a popular format for high color depth images. GIF/JPG format is widely supported by many different kind of software. They can be viewed in many image formatting software, word processors and Internet browsers. It is because of their easy view-ability that GIF/JPG files are so often used. But a GIF/JPG file is not easily editable in its original form. Solution: we can convert your GIF/JPG files to DWG file format. Format Conversion starts with a blank document and manually recreate the CAD drawing based on the GIF/JPG image. Our output is truly computerized in that it is “vectorized” because we actually redraw it. We guarantee 100% accuracy in the final output. 1. The final output is editable and will be in DWG format because we create the drawing as a new file. 3. Text is separated and has its own layer and is recognizable as text. 5. We use blocks for different entities (like doors, windows, electrical fixtures, plumbing fixtures, furniture, etc.). We use a combination of both manual techniques and our proprietary technology to make your AuoCAD file error-free. Our clients prefer the use of manual vectorization because old drawings often lose their clarity and original dimensions. If we were to scan them in GIF/JPG format and convert them using auto-vectorization software the dimensions in the DWG file would reflect the errors that are introduced due to the aging of the original paper drawings as well as distortions caused by the scanning process. Our experts carefully digitize your drawings accordingly to the dimensions mentioned in the original drawing, giving you error-free, easy to manage and multi-level DGN files. high-quality, DWG conversion services to increase productivity. 2. Many data conversion companies use auto-vectorization software tools; these lack accuracy and have limited utility. 3. Format Conversion gives you the best CAD conversion solutions at very reasonable prices. 4. You can send us your GIF/JPG files via fax, e-mail, CD’s or through FTP for DWG conversion. 5. We will deliver the converted files to you overnight.